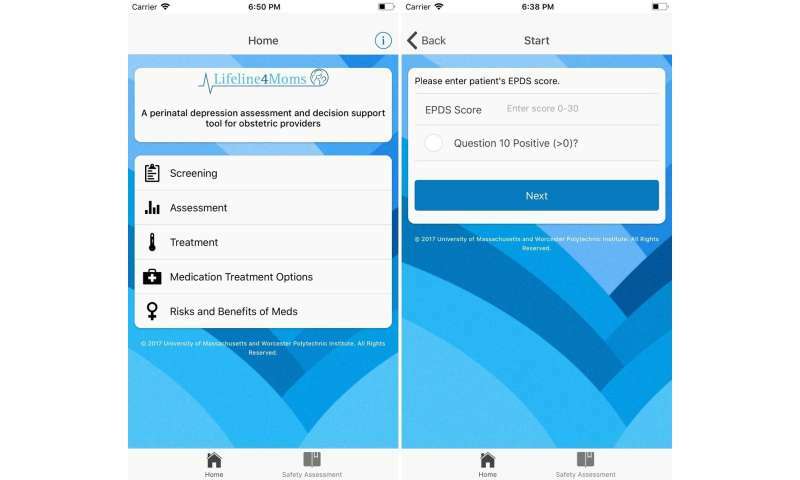 A researcher at Worcester Polytechnic Institute (WPI) has launched a mobile app that will give obstetric providers an important new tool for assessing perinatal depression in women and guiding them to treatment. Perinatal depression affects one in seven women and is the most common medical complication of pregnancy. The app, called Lifeline4Moms, was developed by Bengisu Tulu, associate professor of business at WPI's Foisie Business School, and tested by colleagues at the University of Massachusetts Medical School (UMMS). It was designed as a how-to decision aid, not a diagnostic tool, for obstericians and other maternal healthcare providers, who generally are not trained to diagnose and treat psychiatric illness. The app provides a comprehensive list of symptoms of mild, moderate and severe depression and offers suggestions for treatment paths, as well as guidance on how best to talk with the patient about her mental health needs. Perinatal depression, which includes major and minor depressive episodes that happen during pregnancy or in the first 12 months after delivery, can have "devastating effects on women, infants, and families," according to the American Congress of Obstetricians and Gynecologists (ACOG). Although symptoms vary greatly, common indicators include anger, depression, fear, fatigue, insomnia and panic attacks. A combination of screening, treatment and follow-up are critical to help women suffering from depression. "Perinatal depression is a major problem," agreed Tulu. "By using Lifeline4Moms during an office visit with a patient, obstetric caregivers can map out a treatment plan and help the patient make an appointment with a counselor, for example, to increase the likelihood that the patient will actually follow up and get the mental health care she needs." The app builds upon the Edinburgh Postnatal Depression Scale, a depression screening that is traditionally given to a patient during the early stage of her pregnancy, during the second half of pregnancy, and post-partum. Coupled with that screening, the Lifeline4Moms app offers suggestions for how to talk with women about these symptoms and the various treatment and support options, including medication, therapy, and lifestyle changes. The app was created through a WPI Major Qualifying Project (MQP), a team-based, professional-level design or research experience that all WPI undergraduates must complete. Over the course of three seven-week terms, Tulu and the student project team worked to design the app's user interface, the proper workflow among the different screens, and the best way to present the information correctly. "I thought it would be interesting to look at how technology can create opportunities to support the perinatal depression journey, both for providers and patients," said Tulu. A prototype of the app was tested by resident obstetricians at the University of Massachusetts Medical School (UMMS), which was the project sponsor. The doctors reviewed the app for value, usefulness, and design; results were presented at the American Medical Informatics Association conference in November. The MQP team consisted of five management information systems majors: Nicolas Adami-Sampson, Trivani Shahi, Nicholas Shannon, Leif Waugh, and Drew Wethern. The project was sponsored by two current faculty members at UMMS: Dr. Nancy Byatt, associate professor of psychiatry, and Dr. Tiffany A. Moore Simas, associate professor of obstetrics and gynecology. Dr. Kathleen Biebel, formerly of UMMS and now deputy commissioner at the Massachusetts Rehabilitation Commission, was also a sponsor. Lifeline4Moms is available for the iOS and Android platforms through the Apple and Google Play app stores.